The Foundation has expanded its network of textile recycling and cooperation with the addition of several establishments of Condis, Hiber and AhorraMas supermarket chains. The agreement established with Condis collects installation, in a first phase, a dozen containers in 12 supermarkets in Catalonia. On the other hand, has expanded its partnership agreement that stayed with Ahorramás, incorporating 12 containers more than 8 already present in several supermarket in the Community of Madrid and Toledo. For Hiber, just an agreement to establish the location of containers at four of the company. 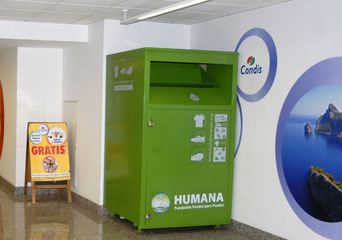 The inclusion of private partners to diversify the location of textile containers Humana, making them more accessible to citizens. It is also an initiative that is part of the corporate social responsibility programs of many partner companies. 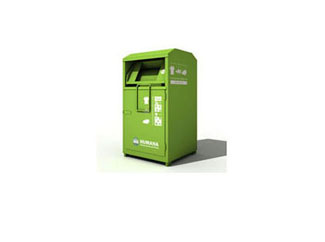 With this, the usual street locations, municipal recycling centers and facilities added locations such as supermarkets, shopping centers, parking lots or gas stations. Our organization also promotes timely collection campaigns in other commercial spaces and private facilities. The Foundation offers businesses and municipalities the possibility of joining a network backed by professional service and over 25 years experience in over 30 countries.